Paris Saint-Germain vs Liverpool – Two titans of European football clash in UEFA Champions League action as Paris Saint-Germain host Liverpool. The result will have a dramatic outcome for both clubs’ chances of progressing through the group stages. With just one point between the two teams and Napoli leading the group, all is at stake in this huge Group C match. PSG are priced at 23/20 by SkyBet to win in front of a home crowd. The Ligue 1 leaders are tearing things up in the domestic competitions and have their eyes firmly set on European glory. Their attacking force could take a possible hit with both Neymar Jr and Kylian Mbappe both injury doubts ahead of the match. Edinson Cavani will be the talisman in their possible absence and is priced at 9/2 to break the deadlock. Their defensive capabilities have been really tested in Group C, with seven goals conceded in 4 matches. That’s the same amount of goals they’ve conceded over 14 league matches. They face a frighteningly potent attack and are priced at a huge 4/1 to win to nil – worth backing if you think Klopp’s men will have an off day. Liverpool are priced at 2/1 to come out victorious on Wednesday night. 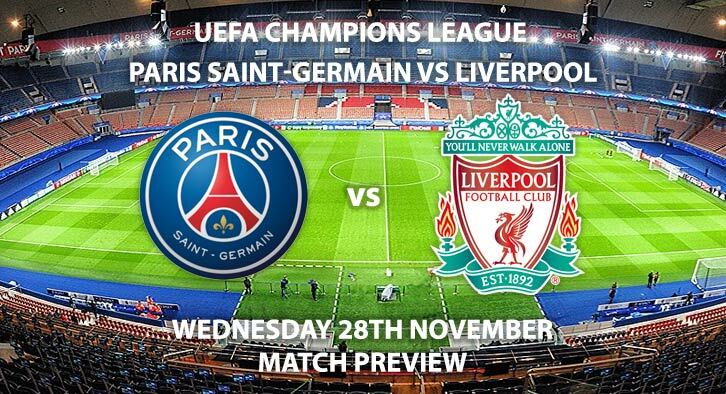 Klopp’s men will hope to repeat their performance in their last fixture against PSG where they ran out 3-2 winners. While they still boast an unbeaten record in the Premier League, their European campaign was slightly soured by a 2-0 loss to Red Star Belgrade in their last outing. Roberto Firmino was on the scoresheet last time against the French outfit and is 2/1 to score anytime. With Mohammed Salah and Sadio Mane also fit and reading for the match, they will be dangerous – especially on the counter attack. When these two lock horns expect plenty of action and goals. SkyBet are offering 1/2 for over 2.5 goals and 2/5 for both teams to score. If you fancy some longer odds then both teams to score in both halves is 9/2. The referee for this match will be Szymon Marciniak. With so much riding on the outcome of this fixture, it could turn into a feisty encounter. The match will be televised on BT Sport 2 and kicks off at 20:00. – Home advantage could be key as they must get a result. A reverse score line from the reverse fixture. Correct Score – Paris St Germain win 3-2 – (link no longer available). Both Players to score – Edison Cavani and Mohammed Salah to both score – 4/1. Popular RequestABet – Neymar to score from outside the area and Liverpool to score a penalty – 100/1. @FootyAccums RequestABets – Neymar & Firmino to score and Marquinhos & Henderson to be carded – 125/1. Price Boost – Player to score outside the penalty area – Neymar – 12/1. Odds and markets last updated on Wednesday 28th November 2018 @17:50 GMT. Keep checking back to see if there’s any updates to markets – the time stamp in the previous sentence for when we update tips on this page will be updated.